The first episode of 2019 picks up at the abandoned warehouse after a high Antonio killed the man who hurt his daughter by pushing him out of a makeshift window and to his death. Knowing that Antonio is going to go down for taking drugs, he tells him to scram and begins instructing Ruzek on the new story. Ruzek isn't comfortable lying and placing all the blame on Voight because he knows that with Voight's reputation, they are going to use this to take him down. However, Voight orders Ruzek to corroborate the story. When the cops finally arrive, Ruzek pulls a fast one and tells them that the offender lunged at him and tried to grab his gun so he defended himself. Voight is equally as surprised as he is pissed off, but he's unable to object to this new lie. As Ruzek gives his testimony, Voight tells the rest of the Intelligence unit to get back to work. At the station, he orders them not to ask any questions because the less they know, the better. The team begins working on a carjacking case which takes them to Canaryville, a neighborhood where Ruzek grew up. Ruzek taps his CI, a guy he used to be friends with before they went their separate ways, but since he's being kept on a short leash, Voight accompanies him. The guy isn't eager to cooperate, but they promise that this will be the last thing he has to do to clear his charges. He delivers them a guy named Billy, the owner of a shady chop shop. Billy admits to working with the carjackers, but he doesn't have their names. The suspects strike again, this time stealing the car in broad daylight and shooting the 18-year-old driver point-blank. Ruzek brings his CI in for more information, but the CI claims the carjacker in the picture is a dude from out of town. As they are investigating, another carjacking occurs nearby. Upton and Ruzek respond, chasing the car off the road, shooting one of the men dead and saving the woman who was badly beaten. However, one of the men was able to get away. Despite the CI's false information, they are able to piece everything together: Johnny, the CI, was close with both the carjackers and warned them that the police were onto them. They are finally able to locate Mark, the shooter, who isn't listening to Ruzek as he orders him to get on his knees. Voight interjects as he notices Mark is attempting to reach for a gun. As Mark is arrested, he makes some wise-crack jokes about Ruzek trying to be like his daddy. The CI is arrested on both new and old charges. 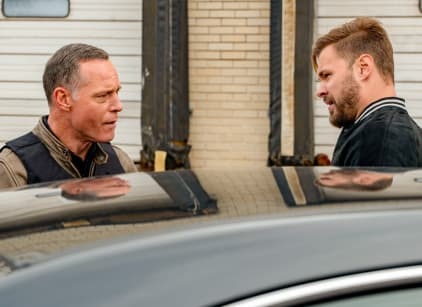 Meanwhile, the IRT pays Ruzek a visit to question the validity of his officer-related death story as they found fresh blood at the scene that didn't match the suspect. Upton confronts Ruzek about what really happened and tries to convince him to give up on this notion of brotherhood or he'll ruin his career. When a screaming-match ensues, Halstead interrupts to let them know everyone can hear them in the hallway. Later, Upton appeals to Voight in hopes that he'll stop Ruzek from taking the fall. She confesses that she'd rather not be risking her career for a "guy she's dating," but she knows that he deserves better. Voight tells her that he's doing everything he can, but at the end of the day, it is going to be Ruzek's decision. He offers him the chance to bring in Ruzek and walk the story back. Voight approaches Ruzek to persuade him to give this up and let him take the fall for Antonio's mess. Uncertain of what he should do, Ruzek pays Platt a visit at her home to find out what she thinks. She assures him that it isn't going to be good for Voight as they will dig up all the dirt on him in an effort to end him, however, he's Voight and he'll probably find a way out of it. At the end of the episode, we see Ruzek sitting with corporal alleging that his testimony of what happened is true and accurate. Upton finally tells Halstead about her relationship with Ruzek and admits that though it started out casual, she ended up falling for him. Ruzek is dealing with an officer-involved death investigation. And that's the last this team will discuss it. You never have to explain something you didn't say or hear. Voight: Who the hell do you think you are? You don't protect me. I protect you. That's my job. I'm the one who allowed Antonio to be there. This is on me. From this point on, you don't say another word about this, you get me? Permalink: Who the hell do you think you are?